Thumbnail from the YouTube video "El Galeón de Manila. La aventura de los tesoros de Oriente (Manila Galleon) HRM Ediciones" by Arturo Sanchez. 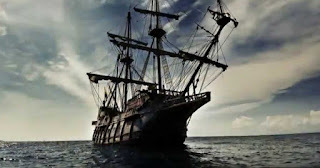 Most Filipinos, from high school history books, ought to have a fundamental knowledge of the so-called Galleon Trade, that maritime link across the vast expanse of the Pacific through which the Philippines maintained its contact with Nueva España (Mexico) and, therefore, the mother country Spain itself. Neither do the books really narrate that many of these galleons were crewed by Filipinos, most of whom were of the Malay stock that the Spaniards called “Indians” or Indios, although there were also mestizos or offspring of Spanish-Filipino intermarriages. In other words, Filipinos had been travelling to the Americas since the 16th century. Living conditions in these Spanish ships were Spartan, to say the least; and particularly so for ordinary sailors. Living quarters below deck were cramped and “inappropriate for most human habitation.” While the sailors were fed three times a day, water was limited to a daily ration of one litre and food could be as drab as horse beans, chick peas, rice, oil, salt meat or pork and/or cheese.2 Moreover, sailors were also often subjected to abuse by the ships’ Spanish officers. Thus, it was not uncommon for these Filipino crewmen of the galleons to jump ship once they arrived in Acapulco, never to return to the Philippines. Most would assimilate into their new environment, where the locals, thinking that they were Chinese, referred to them as Chinos. In many cases, the Filipino bloodline would be diluted down the years by intermarriage with the locals; but even in the present day, there are those in present-day Mexico who are aware of their Filipino lineage. Up north from Nueva España in what is present-day the United States, the earliest recorded instance of Filipinos arriving was in October of 1587, just over two decades since the conquistador Miguel López de Legazpi first arrived in the Philippines. The Filipinos, called “Luzon Indios” at the time, were on board the Nuestra Señora de Buen Esperanza, captained by Pedro de Unamuno. One of the more extraordinary crossings of the Pacific by early Filipinos led to the founding of a Filipino community in Louisiana. How they got there as early as 1765 continues to be something of a mystery. Acapulco, the destination of galleons which had sailed from Manila, is on the western side of the North American continent. Saint Malo, the fishing village that these Filipinos founded in Louisiana, is in the Gulf of Mexico 1,782 kilometres away. This settlement is thought of as not only the first Filipino but the first Asian community in what are the present-day United States. That they jumped ship to escape from the Spaniards was highly likely and would have had precedence. 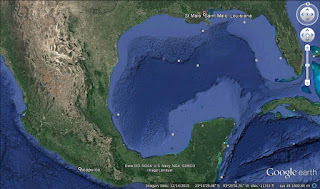 Image credit: Google Earth. The distance from Acapulco to St. Malo is 1782 kilometre. For them to have gotten so far to the east of the continent when it was as yet basically unexplored is what continues to baffle historians. Hearn went on to say that beneath the houses were mud and pools of water, sometimes with the hoof marks of pigs and even chickens or tracks of alligators. The village was so well-hidden, he said, that it could not be found on any map; and that the United States Mail Service could not possibly find its way there. Engraving by Charles Graham after sketch by J.O. Davidson. Published in Harper's Weekly, 1883 March 31, vol. 27, p. 196. Public domain. Wikimedia Commons. From Saint Malo, the Filipinos would branch out and build similar communities elsewhere in Louisiana, with houses built on stilts like they would have been in many coastal communities in the Philippines at the time and even in the present day. They would become known as the “Manila Men” or the “Tagalas” and be credited with introducing the technology of drying shrimp to the area. 1 Manila Men in the New World: Filipino Migration to Mexico and the Americas from the Sixteenth Century, by Floro L. Mercene, 2007. 2 Life on Board a Sixteenth Century Spanish Ship. Online at Palm Beach County History Online. 3 Luzones Indios - First Filipinos in the U.S. Online at the Filipino American National Historical Society. 4 Historical Landmark, declared by the Filipino American National Historical Society, California Central Coast Chapter, Dedicated October 21, 1995. Online at Morro-Bay.com. 5 Lafcadio Hearn's America: Ethnographic Sketches and Editorials, by Patrick Lafcadio Hearn. 2002.